Be very careful how you live, not as unwise, but as wise, making the most of every opportunity, because the days are evil (Ephesians 5:15-16). Knowledge is good, but there is a vast difference between “knowledge” (having the facts) and “wisdom” (applying those facts to life). To have knowledge is not to be wise, but to know how to use knowledge is to have wisdom. We may amass knowledge, but without wisdom, our knowledge is useless. Many men have a great deal of knowledge and are all the greater fools for it. We must learn how to live out what we know. Wisdom is like a sixth sense. It enables us to evaluate circumstances and people, and make the right decisions in life. I will admit there have been many occasions where I have been unwise. I have been a fool in many ways and this has led to serious consequences in my life and the lives of others. It is not unusual for people who lack wisdom to walk blindly into situations without giving much thought to the outcome. Unwise people do not consider the consequences that follow their unsound decisions. The Bible, however, instructs us to walk wisely. This means to scope things out, to think things through, and to look at things from every angle. It is all-encompassing. The wise person demonstrates caution in his relationships, finances, decision making, business transactions, family matters, and everything else. Wisdom takes us beyond the realm of mere right and wrong. Wisdom takes into account our personalities, strengths, weaknesses, environment, and even our present state of mind. Wisdom is often the tool God uses to personalize His will for our lives. What is wise for you may not be wise for me – and vice versa. All of us are tempted to excuse things because they are not overtly wrong. No specific verse of Scripture prohibits them. But wise men and women don’t ask, “Is there a verse that prohibits this?” Instead, they ask, “What is the wise thing for me to do?” It is not enough to merely stay on the right side of the line that divides right from wrong. In many cases, God would have us stay a safe distance away from the line itself. “The fear of the Lord is the beginning of knowledge, but fools despise wisdom and discipline” (Proverbs 1:7). Fear refers to reverence and respect. Too often, we want to skip this step, thinking we can become wise by life experience and academic knowledge alone. But if we do not acknowledge God as the source of wisdom, then our foundation for making wise decisions is shaky, and we are prone to mistakes and foolish choices. The wise person fears the Lord, trusts Him, and seeks to obey His will. Wisdom begins when we acknowledge God for who He is, when we recognize His ways are best. Wisdom begins when we submit ourselves to His will, trusting that if we could see our lives from His perspective, things would make perfect sense. The only way to become truly wise is to fear (revere!) God. This entry was posted in Topical and tagged Decisions, Devotions, Holy Spirit, Lord, Proverbs, respect, reverence, Submit, Wisdom. Bookmark the permalink. Very true! The only true source of wisdom is God! Thank you for such a clear and decisive message about the importance of living life through and only through God’s wisdom. Thanks for commenting! Two kinds of people portray two contrasting ways of life. The fool is the wicked, stubborn person who hates or ignores God, while the wise person seeks to know and love God. Solomon received wisdom knowing its value and God provided it. Your writing talked of fearing and trusting the Lord. i just saw the comment from your dad!!!! very cool joe! me and mine never had the chance………next time you have a rough spot,….think of your dad. there is always something to be truly thankful for……..
Amen my friend. Wisdom is the greatest treasure of all. I really needed to hear this today. I have a ton of knowledge..but I really need some help in the wisdom department. Thank you so much for this! Thank you, Anne. To God be the glory! I always remember Pastor John Wimber of the Vineyard Church movement speaking about the difference between knowledge and wisdom and it was an “ah ha!” experience for me. It made so much sense because I was seeking knowledge but so often lacked wisdom. Knowledge can accumulate facts and reflect upon experience, but it doesn’t have the ability to discern what is the best path to be pursued. I guess that’s why God encourages us not to trust in our own understanding. Thankyou for your very clear and practical insights. May your ministry abound in God’s wisdom as you continue to trust in Him. Very true indeed! Wisdom is more than intellectual pursuit. Wisdom is a gift for sure. We can read the Bible until the cows come home and only become like a Pharisee. Wisdom is the difference and it is from the Holy Spirit bringing the Word to life in us. Thank you for this entry. I agree wholeheartedly! Without wisdom, our knowledge is useless. Oh, WELL said. And that wisdom is just sitting there waiting for us to ask for it! We’ve found this true with so many believers we work with who are struggling to be victorious in their walks… but it’s the proverbial “playing with fire” thing. The line isn’t there to lean on, to rest on, to test. Want victory? Get away from the line! Want to know how? Ask for wisdom and He’ll show you how, one step at a time. Before we accept an invitation, implement a plan, sign our name to anything, and agree to participate in a venture of any kind, we should ask ourselves at least one important question: What is the wise thing for me to do? Amen. And to this we can add understanding and discernment. Well said brother. Thanks for pointing out this verse! I am blessed by your words today Joe! Thank you, my friend. To God be the glory! Thanks for stopping by my blog. I enjoyed your perspective on wisdom. It was dead on! I am in the midst of a conversation with someone who has a slew of knowledge yet no wisdom from above and they are walking in foolishness. Straight is curved, up is down, right is wrong, and evil is good. It is sad, but no amount of speaking or sharing will open their eyes. Only God’s grace can save this person from them self! Very true indeed! Once caught in the downward spiral of sin, none of us can pull ourselves out. We must trust Christ alone to put us on the path of escape. Wow, this is an excellent post. Glad you stumbled along my blog so I could stumble onto yours. 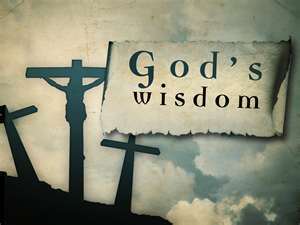 “Wisdom is often the tool God uses to personalize His will for our lives. What is wise for you may not be wise for me – and vice versa. All of us are tempted to excuse things because they are not overtly wrong. No specific verse of Scripture prohibits them. But wise men and women don’t ask, “Is there a verse that prohibits this?” Instead, we ask, “What is the wise thing for me to do?” It is not enough to merely stay on the right side of the line that divides right from wrong. In many cases, God would have us stay a safe distance away from the line itself.” – I needed to read this today. I’ve made so many mistakes to the point where before I accept an invitation, implement a plan, sign my name to anything, and agree to participate in a venture of any kind, I ask myself at least one important question: What is the wise thing for me to do? I still make poor choices at times, but I’m growing. All those spiritual gift tests return results identifying my spiritual gift as knowledge. I’m still trying to figure out what to do with it. I know enough to realize I’d rather have wisdom. I know God has His reasons, but it’s one of those things I’m going to talk to Him about when I get there. I always enjoy hearing from you, Jane! Since you are filled with knowledge, I will try to sound smarter than I really am. By and large New Testament wisdom has the same intensely practical nature as in the Old Testament. Seldom neutral, it is either God-given or God-opposing. If divorced from God’s revelation it is impoverished and unproductive at best (1 Cor. 1:17; 2:4; 2 Cor. 1:12) and foolish or even devilish at worst (1 Cor. 1:19; Jas. 3:15). Worldly wisdom is based on intuition and experience without revelation, and thus has severe limitations. The failure to recognize these limitations brings biblical condemnation on all who haughtily attempt to cope with spiritual issues by human wisdom. WOW! Did I say that? That was a mouthful! “The fear of the Lord is the beginning of knowledge, but fools despise wisdom and discipline” (Prov. 1:7). Amen. Two kinds of people portray two contrasting ways of life. The fool is the wicked, stubborn person who hates or ignores God, while the wise person seeks to know and love God. I really love the work you are doing here. Thanks for sharing and may God continue to bless you as you allow him to use you for his glory. Hi Joe, I’m new to your blog, but i must say that this post is very timely for me. I spent several hours today praying for God’s guidance, and I admit I did not ask, “What is the wise thing to do?” Instead I fell into the trap of asking what the ‘right’ thing to do is. I think I’ll head back to my Bible for a few minutes of meditation on James 1:5. Thanks for sharing! Thank God this valuable resource (wisdom) is readily available to guide our choices. This was a great post. I especially like the first paragraph and the differences between knowledge and wisdom. Thank you. Wisdom is more than intellectual pursuit. Without wisdom, our knowledge is useless. Making the most of our time to act out for The Right to overcome the forces of The Wrong is wisdom in action, indeed! Thank you so much for “liking” my recent post, Joe! Hope you will join us often on our critterly journey! I loved the way you explained this! Thank you and God bless you! So true! Sometimes I wonder if this can become an opening for divisions within the body of Christ. Some will say that ‘God told them to do it THIS way, therefore it must be the same for everyone else, and if you’re not doing it their way, then you are not doing God’s Will’. It can make it painful and isolating for those who are struggling to follow Him…. I agree. There is biblical truth and then there is opinion. We would do well to realize the difference! Guess that’s why it’s we were taught to pray for understanding and guidance(and thy will be done) rather than sales, business opportunities, and things. I need to put Eph. 5:15-16 up as a banner in my home and at work. I’ve got to keep this front and center right now. We all do! That would be a helpful reminder! By saying, “the days are evil,” Paul was communicating his sense of urgency because of evil’s pervasiveness. We need the same sense of urgency because our days are also difficult. We must keep our standards high, act wisely, and do good whenever we can. Good post, Joe. Thanks for visiting my site. It’s incredible how lost wisdom is in today’s society. Thank you for the reminder. Hey, I like what you said in the comments about there being a difference between biblical truth and opinion. I’m not sure yet where you’d draw the line (probably need to read more of your blog) but for me I feel like a lot of standard doctrines cause fights because people fail to differentiate between biblical truth and differing interpretations or opinions. Thanks for checking out our site. I’ve enjoyed yours so far. Very true indeed! I like what you are doing with your blog. The URL caught my eye and I’m glad it did! I’m wondering how do you differentiate between biblical truth and differing interpretations or opinions? Or better yet, what truths do you consider fundamental to the Christian faith? That’s a great question. I may try to respond with a full length blog rather than try to capture all the complexity and nuance in a comment section. Probably won’t happen this week because I’m preaching for mothers day in addition to my normal weekly duties. Soon though. I understand! Let me know when you post the article. I would be interested in reading. Hi James, just checkin in. How’s your day going? So right after I posted this, over 2 years ago I kind of quit writing all together. Personal, Life stuff got in the way. I haven’t stopped thinking about this questions though. It ended up being tougher than I thought. Thank you for this post – it was very encouraging – so glad that you found my blog and liked my post on wisdom, or I would have never seen this. Thank you for the encouragement! I’ll continue to seek the Lord for wisdom. Thanks Mike! I look forward to connecting more! So true, thank you for posting. very encouraging. Glad to hear! I’m still learning too! That path of least resistance thing you mentioned. How true, how true. So many times we like that path because it is easy, but do not think about how it is keeping us “weak”! Strength building requires resistance. Do we really want to live weak? Again, wisdom has the better way. Great teaching, Joe. Very true indeed, my friend! Many people have prayed for me to have the wisdom of Solomon and I’ve stayed their hand and said no thanks; the day came all Solomon’s wisdom failed just read 1 Kings 11. But the Good News The Greater than Solomon has come and He has become to me “Wisdom from God, and righteousness and sanctification and redemption.” Paul continues; “So that, just as it is written, Let him who boast, boast in the Lord.” (1 Cor. 1:30-31) We like the wells of Jacob have life giving water within us but by our thinking have heaped great stones of doubt and unbelief over the entrance and never release all God IN Christ has given us. Thanks for commenting, but I’m not sure what you are trying to say. Please rephrase. I hear lots of New Covenant believers hung up on the wisdom of Solomon, whenever wisdom is brought up he is usually the 1st one mentioned. His wisdom failed, The wisdom we have been freely been given by God In Christ will not fail us but sometimes we have to roll away the stones of doubt and unbelief for that wisdom to be released not only for us but to bless others as well. Jesus the Greater than Solomon indwells us let us learn to draw from the well spring of life that is ours IN Christ. Thank you for visiting Mission Venture Ministries. Blessings on your day and on your work for the Lord. Thank you for visiting Mission Venture Ministries. Blessings on your day and on your work in reaching the lost. I have heard it said that knowledge is knowing that a tomato is a fruit; wisdom is not putting it in a fruit salad. I’ve never heard that before, but I like it! Hi, Joe… Thanks for visiting my blog http://jesuschristthewaythetruthandthelife.wordpress.com … you have been there a few times, and I am so glad you stopped by! I love this post, so full of truth. It reminds me of the eternal truth of Jesus Christ when He said, ‘Seek ye first the things of God, and all these other things shall be added unto thee.’ I truly believe this includes wisdom; Jesus will never turn away anyone who seeks to know Him. Have a blessed day, and may God prosper you greatly in your work for His glory. Thank you, Tony. Sorry it took me so long to respond. I was away on vacation. Thank you for stopping by Affinities, Joe. May God continue to lead you and your wife and family as we head into those times Paul wrote about to Timothy, when people seek only to have their ears tickled. You’ve got inspiring and sound teaching going on here. Thank you, my friend. Sorry it took me so long to respond. I was away on vacation. I like what you have started here, mate. I’ve written a blog along the same lines, but interpreting proverbs 1:7 a little differently. Instead of letting our definition of the word “fear” interpret the scripture for me I allow the bible to do the work. Check it out, and let me know what you think. Thanks Mike! I checked out your post. Looks good! I think we are saying the same thing. I agree we should not bring our own interpretation into Scripture. Rather, we should look for the Author’s intent. What did I say to mislead you? Hey Joe, I think what you’re saying in this post is awesome. Perhaps the only thing for me personally is the interpretation of what “the fear of the lord” is based on the Websters definition of the word fear instead of going directly by what Proverbs 8:13 illiterates the fear of the lord to be. My intent is not to elude, or even directly state that you are wrong, but rather to add to what you have here, and hopefully introduce something some may not have noticed or considered for the purposes of strengthening our spiritual lives which directly impacts our natural lives as the two are intertwined. this kind of attitude and spirit is what draws moths to the flame!!! ya know???? set your light on top of a hill,…and all that????? i was re readin some of conversations that i have copied and pasted into my folders just this morning,…from when we first met till now. through out everything,….there was humor,…laughter,…and joy!!!! (not that “joy” is a common word anymore)…..yup,…the attitude of acceptance and love is good stuff!!!! the “phony” stuff,…well,….it’s like a light on top of a hill too!!!! but unfortunately,…”that type of light”,…acts a whole lot like a “BUGZAPPER DOES!!! !”…….jus sayin…..
toksoon joe bro!!!! glad i met ya!!! !…..oh,….and thanks again! Thanks John! Glad I met you too! Pingback: 11 Reasons Why it is Wise to Wait on God | Joe Quatrone, Jr.
Pingback: Will of God | Joe Quatrone, Jr.